Prototype: German Federal Railroad (DB) type BTms 55 container transport car. The car looks as it did in Era IIIb. It is loaded with four (4) "pa" type Eosakrt containers with steel set-up walls for bulk freight not sensitive to moisture. Car number 015 032. 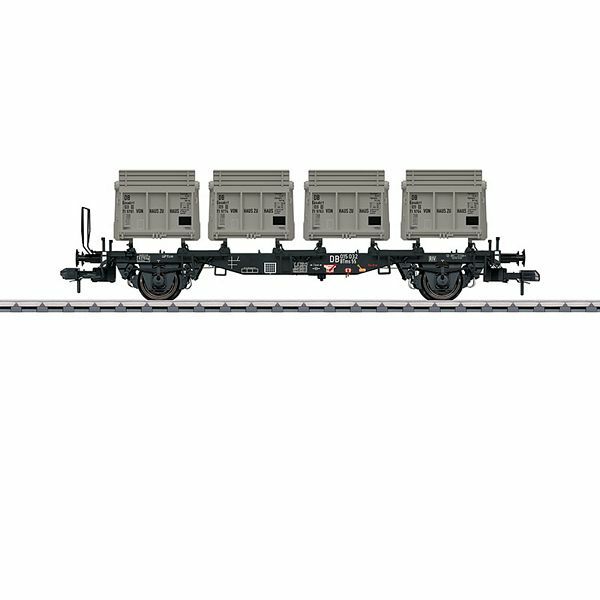 Model: This 2-axle container transport car has a walkover bridge and does not have a hand brake. The frame is constructed of die-cast zinc. The car has many separately applied details made of high quality plastic. The car is loaded with 4 removable "pa" containers. The containers have separately applied details and different registration numbers. The minimum radius for operation is 1,020 mm / 40-3/16". Length over the buffers 34.4 cm / 13-1/2".